One of the burning questions new moms face is, "When am I going to get my body back?" Your body has worked hard growing a baby for nine months, and it's only natural to want to regain your pre-baby fitness level and shape. 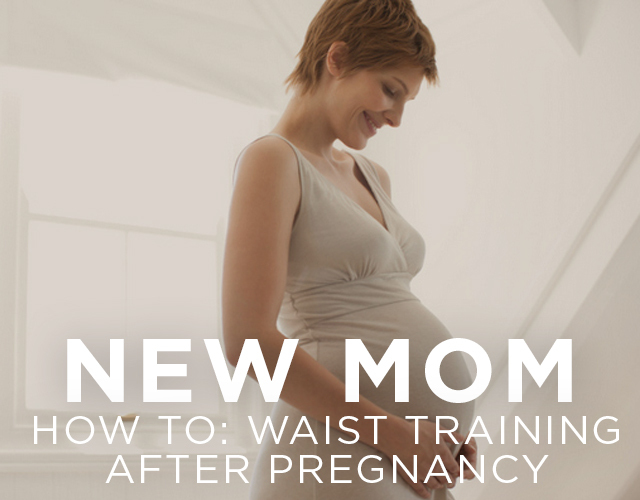 Waist training after pregnancy is a simple way to get you on track to getting into the shape you want to be in. Following a natural birth or a C-section, your body has been through a lot of trauma. Now is not the time for a super tight steel-boned corset! We recommend using a postpartum wrap designed especially for those tender weeks following birth. It will provide the support your midsection needs as your abdominal muscles heal. Compression shorts also feel great, as they will help support your hips and pelvic floor muscles. Gradually increase your time waist training. In addition to a workout band, we recommend using an everyday waist trainer that you can wear under your outfits. These can especially be a huge help if you're going back to work so you can fit into your pre-baby clothes sooner! Start with just an hour or two a day and slowly increase the time you wear your waist trainer each day—up to about 10 hours a day. Cinchers are designed to adjust to your changing body. As your midsection sizes down, pull the clasps tighter. Eventually you will probably need a size smaller—and that is cause to celebrate! Complement waist training with a healthy diet. We hope this goes without saying, but you're really working against yourself if you're not eating well during your waist training. Plus, you're not doing your recovering body any favors. We know it's hard when you have a newborn to care for, but make it a priority to prepare healthy meals with a balance of carbs, proteins and fats. Use whole ingredients and avoid processed meals; limit caffeine and alcohol as well. Before long you'll be looking great and feeling great—helping you be the best mom you can be.